Foliage and Bark: similar or greater spread, rounded outline, sometimes erect, tangled and dense twiggy mass, spiny branches. Leaves alternate, simple, ovate to oblong, 4-9 cm long, sharply serrate, lustrous dark green above, stipules large on current seasons growth. Flowers, Fruit and Seeds: Flowers (red, pink to white) start to appear before leaves in spring (sporadically in fall), solitary or in clusters of 2-4, showy. Fruit yellowish green with reddish blush, fragrant, speckled with small dots, ripen in early fall. 'Cameo': actually C. × supurba (C. japonica × C. speciosa), low form, thornless, flowers double, apricot pink. 'Jet Trail': low growing, 2-3 ft, white flowers. 'Nivalis': upright, vigorous, white flowers. 'Orange Delight': low spreading plant, bright orange flowers. 'Texas Scarlet': compact, low growing, spreading, profuse tomato-red flowers. 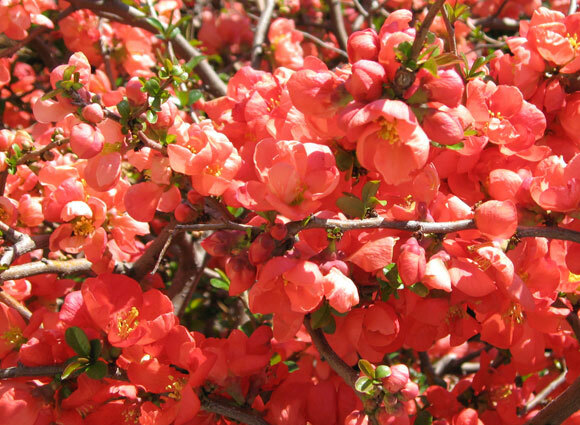 'Toyo-nishiki': upright shrub, 6 ft, with white, pink and red flowers on the same branch.